Some may call the mollusc one of the greatest pests known to mankind the plant world. I’ll give them one thing…. they’re not the prettiest looking fellas on the planet. Famed for eating anything thats green leafed, the damage they cause can often be confused with that of bird damage. The difference is birds will eat through the veins of the leaf where the snails mouth eating parts will not allow them eat anything greater than just the leaf matter. ie the damage they cause is considered interveinal only. 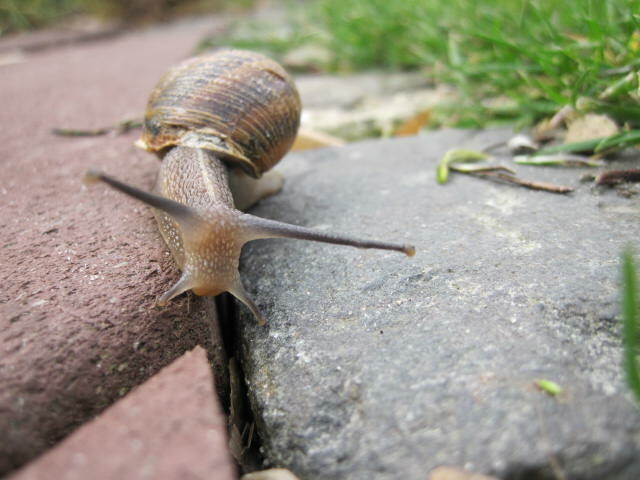 For controlling snails once must start at the very start and that is with good garden hygiene; ie. a good cleaning, pruning and removal of debris regularly from around plants. There is also the use of ‘slug pellets which burns the belly of the mollusc when they move across it. Personally I like to pick them up and throw them into the hens. How do you do it…. ?